Universal design, also known as “barrier-free” or “accessible” design, is an important element in the design process, taking into account a broad spectrum of human abilities. Archaeon is experienced in incorporating diverse and special needs into beautiful living and working environments. 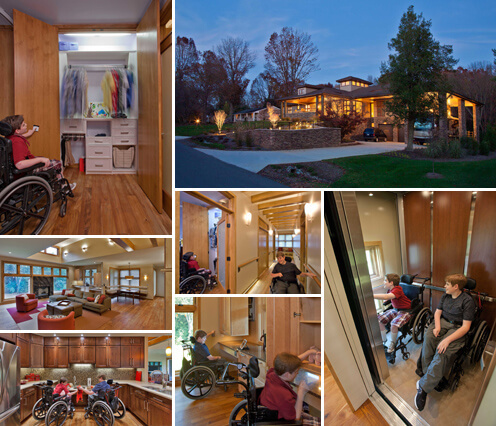 Archaeon has designed several projects for clients with disabilities. Over the years, we have designed new custom homes for clients with special needs and renovated existing homes to accommodate the evolving needs of the present owner. Through smart planning, use of elevators, ramps, widening of hallways and specifying specialty equipment, Archaeon has established a reputation for using Universal Design to create environments that are accessible to everyone. To learn more about Universal Design, click here.